Wind shifts are annoying but they provide more opportunity for gain than anything else. Wind is never constant. This is not news to sailors, who are constantly dealing with shifting wind and wave to maximize performance. On this page, we’ll discuss wind shifts and how to extract maximum performance from them. Another important but less understood phenomenon – wind shear – is discussed here. Wind shifts occur at all time scales – from seconds to days. By definition, wind shifts of less than the reaction time of the boat can be ignored. Shifts on a time scale much longer than the race are also only of academic interest. We’re interested in shifts with a time scale from say 10 seconds to the length of the race (hours to days). Optimal routing is commonly used on long distance races. This technique uses weather prediction (in the form of GRIB files) and polar curves to determine the fastest path to the finish line (here is a free GRIB file viewer). For many sailors, Expedition is the optimal router of choice. GRIB files generally predict wind every 3 hours on a grid 30 miles on a side. If your race is on a scale commensurate with the GRIB, you should certainly consider doing an optimal route to set strategy. If possible, the route should be redone during the race to factor in actual present position and changes in forecast. For the smaller scale, prediction is less important than knowing the current conditions and how local knowledge will affect them. The most fundamental technique for optimal sailing up and down wind is the Target Boatspeed idea. 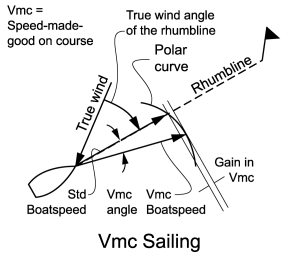 Polar curves allow you to determine the boatspeed at which your Vmg is maximized. There is good reason to use boatspeed and not Vmg to set the optimum sailing point (see the discussion here). This technique implicitly sets the true wind angle to be sailed. 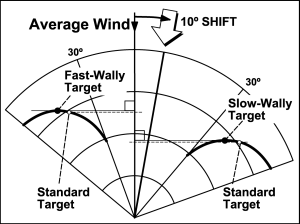 If the wind shifts, heading changes the same amount to as to maintain target boatspeed (and therefore, true wind angle). Changes in true wind speed affect the shape and magnitude of the polar curve, and therefore both target boatspeed and true wind angle. But in general, sailing targets means sailing a fixed true wind angle (as determined by target boatspeed) relative to the wind direction. Targets themselves say nothing about wind shifts. When shifts are added to the mix, there are techniques to get extra performance beyond targets alone (see The Wally). Winning a boat race doesn’t depend only on speed. Cunning plays an important role too. When sailing upwind, if the wind doesn’t shift and two boats have the same performance, they can be said to be even when they are on the same “ladder rung”, a line perpendicular to the true wind. In the figure, Green and Red are even because they are on the same ladder rung. When the wind shifts 10º to the left, Green is suddenly 25% of the lateral separation ahead of Red, and didn’t have to sand a single bottom to do it. This mechanism is why being on the “right side of the fleet” is so very, very important. So how do you know the wind is going to shift left instead of right? By playing the percentages. By observing wind direction, you get a feeling that the average is, say 225º and gain a sense of how shifty the breeze is. Then, because wind always oscillates (more or less depending on the weather pattern), you will know that when the gauge reads 230º, the wind is 5º right, and you can expect it to go left in a while. You can also read the wind shear tea leaves (see Understanding Shear). and How to Determine Shear). In addition to tacking, lateral separation can be manipulated by pinching in the headers and footing in the lifts (doing the Wally – see below). If you don’t overdo it, Vmg isn’t affected much, but lateral separation can be changed a lot. If you’re headed and pinch, your separation is reduced on the boats to to the favored side and simultaneously increased on those to the unfavored side. When the wind shifts, you suffer less damage from the favored boats and gain extra on the unfavored boats. When the wind will oscillate at least 1 cycle before you get to the windward (or leeward) mark, then your objective is to make the best speed up (down) the AVERAGE wind direction, not the present wind direction. This change in perspective moves the little squares on the polar depending on where the present wind is relative to the average wind. 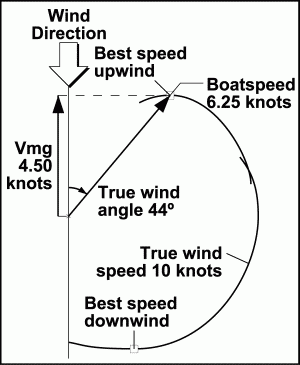 You go upwind (up the average wind) faster than you would if you just sailed to your basic target speed. Your separation automatically moves in the right direction to reduce damage from boats on the favored side, and increase gain on boats on the unfavored side. Why not just tack? There may be tactical or strategic considerations, but more importantly, tacking costs distance to weather. If the shift is too quick or too small, you won’t make up for the loss. Wallying gains distance to weather and Vmg when you can’t or shouldn’t tack. See Tack Analysis – How to find out how much your tacks are costing, and how to optimize them. Let’s say you’re sailing in an oscillating northwest wind with shifts lasting long enough to allow tacking. As the wind starts to lift above mean, you begin to foot. The greater the lift, the more the foot. When the lift hits maximum, you’re going your maximum foot. As the wind swings back to mean, you begin to return to your target speed. When the wind hits the mean, you’re at target speed, and you tack onto the new favored board. You’re always going faster upwind than you would if you just sailed your targets. Your lateral separation automatically changes so you gain more on those on the unfavored side and loose less to those on the favored side when the wind shifts back. What about non-upwind/downwind sailing, like in distance races? In the figure, you can see that bearing off below the rhumbline increases your speed toward the mark. Of course, the disadvantage of Vmc sailing is that you go off rhumbline, and will eventually have to get back. In the upwind case, you can tack. But in the offwind case, you cannot. 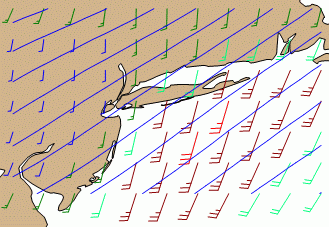 If the mark is days away, the wind will likely change and allow you to consolidate back to the rhumbline. If the mark is minutes away, maybe no Vmc sailing. If the mark is in between, it depends on circumstances. Whether or how much to Vmc sail depends on your knowledge of the future. If you have a GRIB file, and you trust it, you will be able to determine whether or how much to stick your hide out. If the wind is going to shift enough to tack, or at least enough to get you back to the rhumbline, then you can Vmc with confidence.